Looking for adventure as happy as can be. So begins the hugely entertaining pirate romp of ten little pirates who as they go on an adventure across the rocky seas seem to be gradually losing their mateys. Albatrosses, hurricanes, and even mermaids are plotting to separate that jolly crew. Will they ever get together again? Ten Little Pirates is not just your average counting book, it is also an absolute joy to read aloud. The rhyming patterns in the text work to perfection. Counting backwards from ten to one is made fluent as it is integrated in the rhyming, making it easier to work out what the next number might be and inviting little readers also to participate fully in reading the text. Lots of “Arrrrrring” from the little pirates also offers plenty of opportunities for young readers to join it. Simon Rickerty’s artwork is as vibrant as ever and fits the text perfectly. His style is sleek, modern-looking, and he always uses bold and vibrant colours which he emphasises with bold black lines. It is deceptively simple and completely effective. The drawings ooze bounce and fun, and the text and artwork are intertwined, building the tension but also intensifying the comical episodes. Particularly welcome also in this book is the inclusion of girl pirates, as pirate books are often rather aggressively marketed at boys. As well as the obvious counting element of the story, there are also plenty of little details to spot, including a recurrent group of fish. 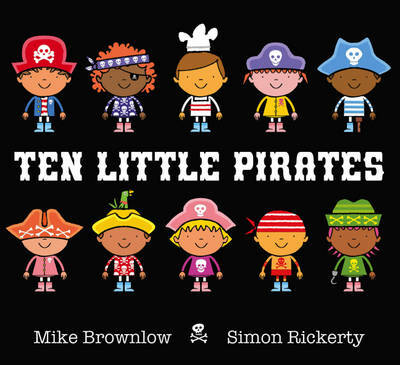 There is so much to get out of this book – not only will it entertain pre-schoolers, whether they are fans of pirates or not, for hours on end, but it will be demanded over and over at bedtime too. Undoubtedly a great book which will inspire plenty of dressing-up and overall piratey fun!